Dumbbells are essential exercise equipment for strengthening and conditioning your muscles. Bowfle﻿﻿x is known for its innovative twists to home exercise equipment. 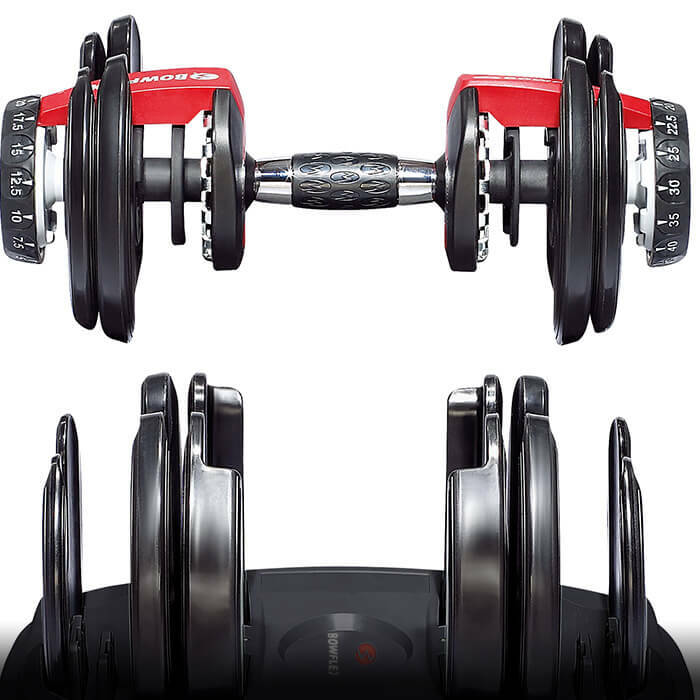 They designed a unique alternative to the traditional dumbbells with their Bowflex SelectTech 552 adjustable dumbbell set. This item is ideal for individuals that do not have enough space for a full dumbbell set and rack in their home.The following content is a detailed review of the Bowflex SelectTech 552 dumbbell set. The Pro’s and Con’s listed below are general comments made by Bowflex SelectTech 552 owners. The subsequent section is MMA Life’s personal review of the product after intermediate usage of it. The MMA Life personnel bought the SelectTech 552 dumbbells without the metal stand that is designated for it. Dumbbell Holder Platform: A platform comes with each dumbbell. This platform has a solid plastic construction. It is supposed to hold the spare weight plates in place as you adjust each dumbbell to the desired weight. Weight plates: The weight plates consist of a metal component covered with a hard plastic molding exterior. Between 5 lb to 25 lb, the SelectTech dumbbells increase in weight at 2.5 lb increments. Afterwards, the increments changes to 5 lb. Dial System: To properly use the SelectTech 552 dial system, the dumbbells need to be positioned properly onto the dumbbell holder platform first. After doing so, simply turn the dials located at each end of the dumbbell to the targeted weight. Handle: The handle has a nice ergonomic shape for comfortably gripping onto it. Furthermore, the rubber exterior of the handle has Bowflex’s logo embossed all over it. This feature gives texture to the handle and helps reduce the chance of accidental slippage. 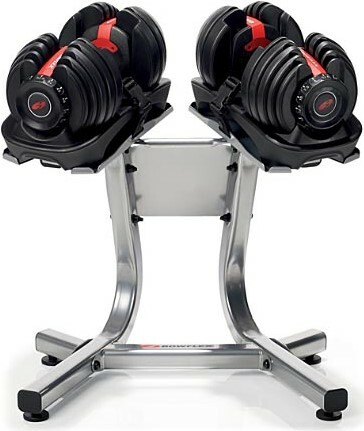 Metal Stand: Bowflex sells a metal stand separately from the SelectTech 522 dumbbells. The metal stand makes it more convenient to adjust the weights and removes the need to bend down to the floor to do so. The overall structure of the SelectTech 552 dumbbells as well as its weight plates are well constructed. The weight plate plastic exterior does a good job of withstanding the abuse encountered during its use. However, all the gears and features of the SelectTech 552 causes it to not have the same toughness as traditional dumbbells. Dumbbells are not meant to be dropped onto the ground in the first place, but the outcome is more devastating if it occurs with the Bowflex dumbbells. Great care will lend itself to the longevity for these Bowflex dumbbells. These Bowflex dumbbells are fantastic tools for working out at home. The design of a platform to hold the weight plates and a dial system for adjusting the weight keeps the user’s room from being cluttered with weights everywhere. Another great thing about the plastic platform is how it protects the dumbbells from damaging its surrounding. Once the Bowflex dumbbell dial is turned in its proper place, the Bowflex dumbbell does a good job of keeping the weight plates in place. However, the weight plates does shift as you exercise. Despite these movements being noticeable, it is minor enough that it does not have a real effect on the workout. The shape of the dumbbells does need some getting used to when you first start training with them. 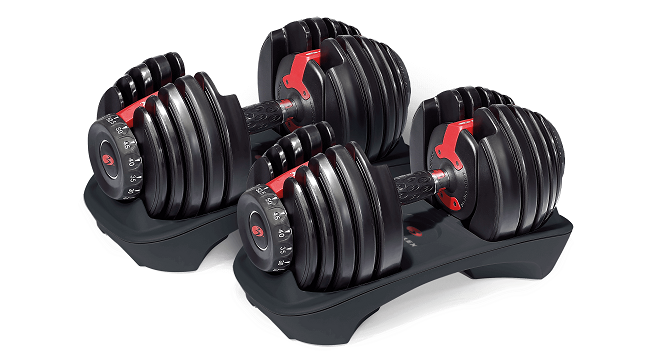 The structure of the Bowflex dumbbells is longer and wider than the traditional dumbbells. Therefore, it can feel awkward and hinder certain exercise movements. The max weight of 52.5 lbs is great for beginner and intermediate level weightlifters. Plus, the increment between each weight is fantastic (2.5 lbs each increment). A problem that gets annoying with the Bowflex dumbbells is when its dial system jams due to misalignment between the weight plates and the handle. These occurrences can be disruptive to your workouts, especially if your workout routine only allows for short rest time or you are following along to a fitness video. As you may have realized, the adjustable dumbbell market has been dominated by three main players within the last decade or so. The three players being the Bowflex SelectTech, The Ironmaster Quick-lock, and the P﻿owerblock. So how does the SelectTech compare to these other two behemoths? ​In terms of pricing, pound-for-pound, the Bowflex SelectTech 552 is the cheapest. Then it is followed by the Powerblock and then the Ironmaster Quicklock. Here is how the pricing works out to be per pound. ​As you can see, the Quick-lock works out to be about $4.10 per pound. The Powerblock works out to be $2.99 per pound. And finally, the the SelectTech works out to be roughly $2.48 per pound. Of course, these prices are prior to the inclusion of tax, which will be dependent on where you live. With the SelectTech, you are getting the most weight for your purchase (105 pounds), as well as the cheapest out of the three. In terms of functionality, the all work well. The Quick-lock has more of a traditional dumbbell feel to it whereas the Powerblock is shaped like a block of bricks. The SelectTech is shaped like dumbbells but it is made out of plastic. Adjustability is important and in that category, the SelectTech seems to win out in this category also. The dial knobs at the end of the dumbbells make it easy for you to easily and quickly adjust the weights.This is especially important if you are doing drop sets. The Powerblock uses pins selectors often seen in traditional gym equipment. And while the weights are color-coded it can be easy to get the pins misaligned. The Ironmaster Quick-lock seems to be the most tedious to adjust. You unscrew the end caps (like traditional dumbbells) and put in extra weights. I've heard that the upgrades to the Quick-lock have made it adjustments quicker since I last used it. The one benefit of the Quicklock and Powerblock is the ability to add on additional weights on top of what comes with your dumbbells. If you want heavier weights for your SelectTech, you actually have to upgrade to heavier versions of the adjustable dumbbells (SelectTech 1090). So in conclusion, all three are great, well-designed, and replace the need for having numerous dumbbells around the (home)gym. The SelectTech is the most budget-friendly and user-friendly of the bunch but lacks the ability to add on weights later on beyond the 105 pounds (or 180 pounds with the SelectTech 1090). However, with that said, the overwhelming majority of buyers will never need anything beyond the weights that come with their adjustable dumbbells. This is especially true if you are are lifting for MMA conditioning. 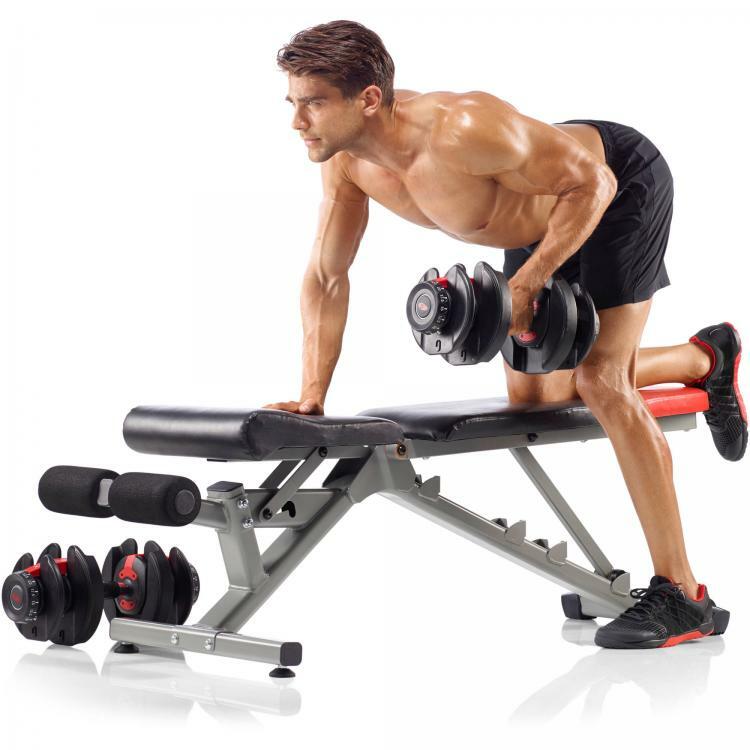 The Bowflex SelectTech 552 dumbbells are great for individuals with beginner to intermediate level of experience in weightlifting. Individuals who yearn for heavier weights should look into Bowfle﻿﻿﻿﻿﻿x SelectTech 1090 model that has their dumbbell go up to 90 lbs.